IDF attacks targets belonging to the Iranian Quds Force in Syrian territory. The IDF on Sunday night attacked targets belonging to the Iranian Quds Force in Syrian territory, the IDF Spokesperson's Unit said. “We warn the Syrian Armed Forces against attempting to harm Israeli forces or territory,” it added. 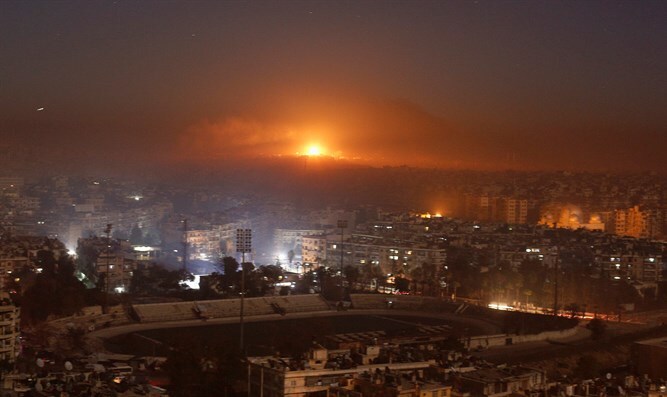 Syrian media reported that the army operated anti-aircraft systems over Damascus in response to the Israeli attack. A Syrian military source told the Russian Sputnik agency on Sunday night that the Israeli attack was “massive” and was took place in several “waves”. “Our air defense systems immediately began to repel the attack of enemy missiles. A significant part of the missiles destroyed before they reached the targets,” the source said. Meanwhile, the Syrian Observatory for Human Rights said that the Israeli air strike destroyed weapons depots and military posts of Iran and Hezbollah in the vicinity of Damascus International Airport and the area of Al-Kiswah and Jamraya. Following an assessment, it was decided that Mount Hermon would not be opened to visitors on Monday, the IDF Spokesperson's Unit said. There are no additional directives for residents of the Golan and the area at this time. Residents have been asked to obey the instructions of the Home Front Command should any be given. The Israeli air strike took place hours after the Iron Dome anti-missile system intercepted a projectile that was identified over the northern Golan Heights area. Earlier on Sunday, Syria announced that its air defense systems had foiled an Israeli air strike in the south of the country. A military source told the official Syrian SANA news agency, "Our air defense systems thwarted Israel's air strike and prevented it from achieving its objectives." However, the source did not add further details. The IDF Spokesperson did not respond to the Syrian reports and claims. Prime Minister Binyamin Netanyahu later hinted that Israel was behind the daytime air strike against Syria. “We have a permanent policy: To strike at the Iranian entrenchment in Syria and hurt whoever tries to hurt us. This policy does not change whether I am in Israel or on an historic visit to Chad. This policy is permanent,” Netanyahu said in N’Djamena, the capital of Chad, as he was about to board an airplane back to Israel. Netanyahu last week broke with his country’s long-standing policy of not publicly accepting responsibility for airstrikes in Syria, and acknowledged that Israel’s air force had attacked Iranian weapons depots at the Damascus International Airport.